The model AB-D auto bias module is designed to optimize the bias for two triode or pentode output tubes in Push-Push (PP) amplifiers that have their own negative bias supply circuit. The AB-D dynamically controls the bias in two tubes. 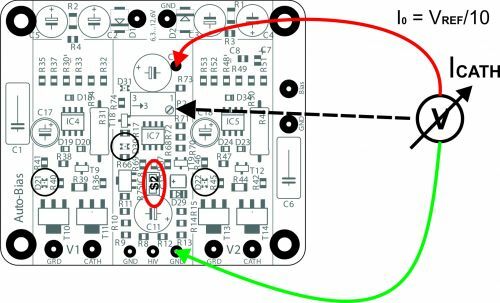 This module may be powered by the filament supply of an amp, with a range from 6.3V to 12.6V AC. It is important to note that the AB-D will not operate if the filament supply has any reference to ground, such as a center tap. - PCB dimensions are 65mm x 57mm / 2.55" x 2.25"
The advantage of using the AB-D module is that it will extend output tube life, in a lot of cases it will also improve the sound and last but not least, you will never have to worry about adjusting the bias again. The AB-D module has two blue LED’s, one for each output tube, which when lit, indicate that bias is at the correct level and that all is good with each tube. When the amp is powered up, at first a red LED will be on, indicating that there is power to the AB-D module. The red LED will go out after about 20s. The AB-D is suitable for class A, AB and C tube amplifies. 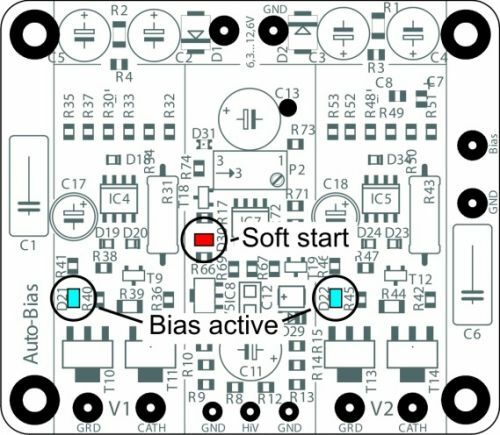 Before the AB-D module can be wired up, you need to preset its bias voltage. This bias level is set using the blue colored trimmer on the AB-D module. We strongly recommend that you preset the AB-D module before you proceed with installing it into your tube amp! 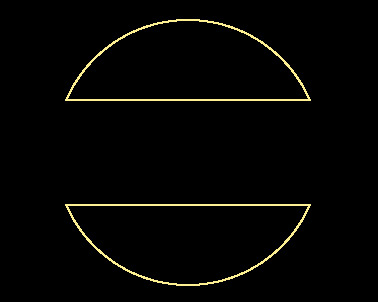 We need to connect a 6.3VAC supply to the AB-D module for the bias preset. If you have a spare transformer with a 6.3V winding, use that, if not, you may need to ‘borrow’ 6.3VAC from your tube amp. If you have a spare transformer, wire it up and connect the 6.3VAC winding to the two 6,3 AC pads on the AB-D module. BE CAREFUL, even though all tubes are removed, there will still be high voltage AC present at the rectifier tube socket! Connect two wires, 6.3VAC to 12VAC to the 6,3 AC pads on your AB-D module. Place your AB-D module on a non-conductive surface. Now switch on your amp or power up your 6.3VAC transformer and you should see the red LED on the AB-D module light up. This LED will go out after about 20s. Set your meter to read DC and to the lowest scale, say 1V, 2V or 5V. Put the black meter lead on any GND pad on the AB-D module and put the red meter lead on the pad next to electrolytic capacitor, see below. Now adjust the blue trimmer until the desired bias level is achieved. That’s it, you just set the AB-D module to the desired bias operating level. Disconnect the spare transformer or power down your amp, wait for half a minute or so and disconnect the wires from the 6,3 AC pads on the AB-D module. DO NOT EVER readjust the trimmer once the AB-D module is installed and wired up. The whole idea is to set in ONCE and forget! Please refer to the drawing below, which shows a typical tube amps connection for your AB-D module. 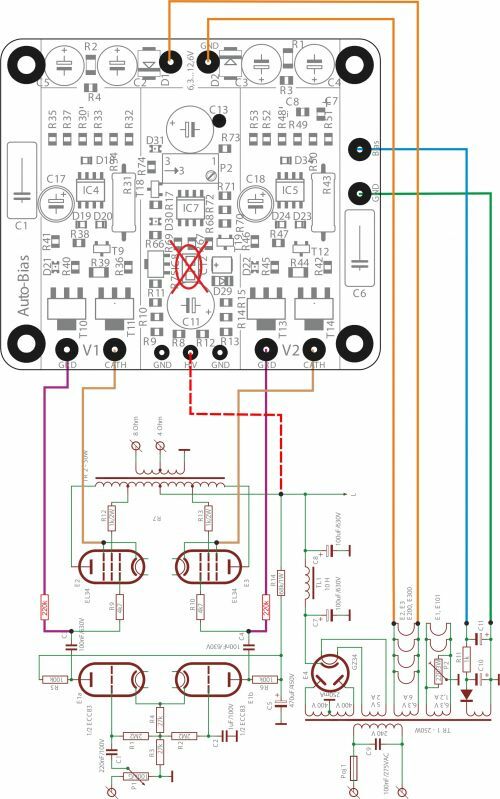 Use this diagram as a reference to the wiring of the AB-D module into your amp. The circuits of the first grids of the output tubes must be equipped with isolation resistors (marked red with the value 100-220k). This diagram shows a typical connection for a Single Ended Amp. If your amps filament supply is indeed referenced to ground, you MUST use a separate small power transformer for this AB-D module, around 2VA, with a suitable secondary supply, anything from 6VAC to 12VAC, or use the ABF-Q module instead which has its own on-board power transformer! There is a jumper link on the AB-D module, shown as S2 in the above diagram. 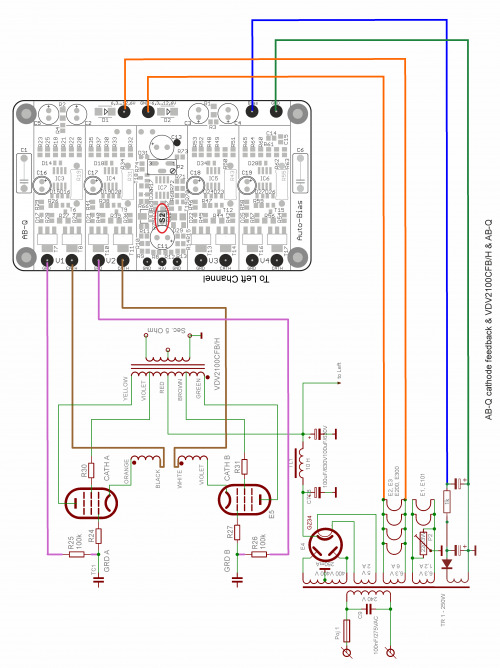 If your tube amp DOES NOT have a startup time delay, leave jumper S2 and DO NOT connect B+ to the HIV pad on the AB-D module, shown as a red wire in the above diagram. If your tube amp has a startup time delay in excess of the AB-D soft start time, ie more than 20s, REMOVE jumper S2 and CONNECT speaker B+ to the HIV pad on the AB-D module! This now pretty much completes the wiring of the AB-D module into your tube amp. Once you are confident that all your wiring is correct and as per the above steps, it is time to test your AB-Q module installation. Plug in all tubes, that is the driver tubes, power tubes and the tube rectifier. In order to see the blue LED’s on the AB-D module, place your amp on its side. Power up your amp. The red LED on the AB-D module should come on straight away and will go out after about 20s. After an additional 40 to 50s, each of the blue LED’s on the AB-D module should start to come on, which indicates that each output tube has reached the preset bias level and all is good. Excellent! If the red LED on the AB-D module does not come on immediately after the amp is powered up, power it back down and check the wiring/connections two 6,3 AC pads on the AB-D module. Make sure all is good there! If none of the blue LED’s come on after the 40-50s soft start delay, power the amp back down. Check all your wiring from the AB-D module to your amp. If say only one of the blue LED’s come on after the soft start delay, power the amp back down and check the wiring to that particular tube for which the blue LED did not go on for. Also check to make sure that the pins in that tube socket are nice and tight and that the tube fits into the socket not at all loose. Also check the pins in the tube socket of any oxidization, if they are dirty, perhaps use Deoxit or similar to clean the pins! Goods of the same category - Module AB-D for 2 tubes, PP & PPP & Single Ended amps, requires 6.3VAC & bias supply from the amps circuit. Not suitable where the 6.3VAC filament supply is referenced to ground, use the ABF-Q below. 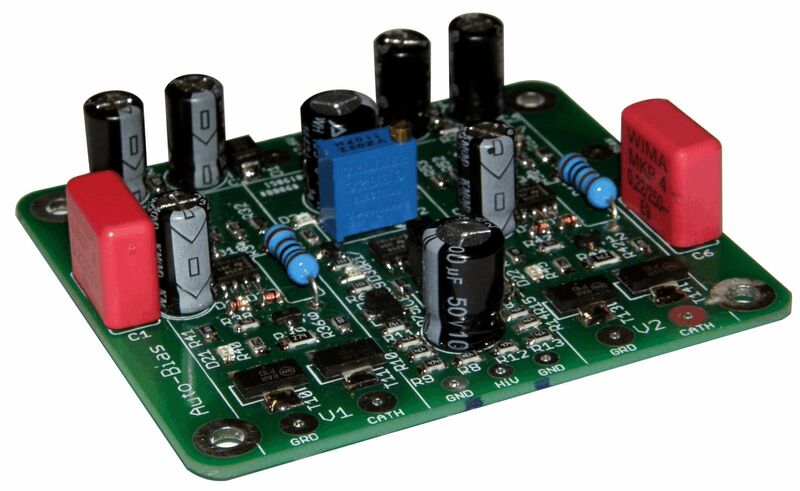 Your inquiry Module AB-D for 2 tubes, PP & PPP & Single Ended amps, requires 6.3VAC & bias supply from the amps circuit. Not suitable where the 6.3VAC filament supply is referenced to ground, use the ABF-Q below.